"Biometric Database of All Adult Americans Hidden in Immigration Reform"
BTC - Here is what it looks like when a George Mason analyst for D.C. city politics proposes a nationalized ID system, like Real ID, would improve prospects for its municipal disadvantaged. It appears as if the system is charged with the greater good of improving the lives of the poor and upending racial or social inequality by giving documents to the undocumented. Or something like that. "But unlike current driver’s license regulations in the state of Washington and New Mexico, Gray’s proposal would create a distinct type of driver’s license that would immediately identify its holders as undocumented. The problem with this approach is that it exacerbates discrimination and endangers immigrants, and our community, even more." The logic is self-defeating or the analysis of this legislation is spun critical to the objective of the legislation c/o The Washington Post. If you give documents to the undocumented but then coordinate a paper status that reinforces the fact that they are "undocumented", what is the point of the exercise? My first thought is that it is meant to confuse you, the reader. Bulk legislative movements originating in Washington D.C. are untrustworthy. Comprehensive Immigration Reform (CIR), like most legislative bulk projects, gives legal form to a dysfunctional institution of hundreds of bills at once, convoluting public debate and oversight. The authors and co-authors claim ignorance of what is in them because of lobby and partisan patrols at their offices. Nothing could be father from the aim of the common good. CIR is not necessary to give documents to the undocumented. Applying paper documentation generously would certainly disperse the air pressure from illegal or non-documentation arguments. Conflict leverage is what is required for politicking. The D.C. bulk legislative trojan has been the preferred vehicle for national ID systems in the past and today. 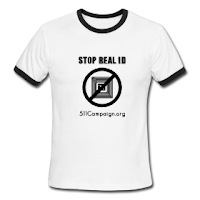 To date, E-Verify in CIR serves as the system to deliver more of an instituted Real ID. 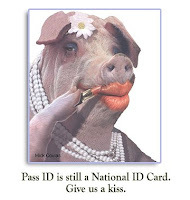 If you want the truth of equality and national IDs you need only look to poor Florida, a State fully invested in Real ID's gold starred licenses. According to an advocate's follow up at the DMV window, 80% of applicants are rejected from receiving licenses to drive in one of the biggest tourism States in the nation. It appears Real ID is anything but indescriminate. It targets denial of service and documentation to most of its residents' driving and identification needs equally. WHAT DO YOU NEED TO OPERATE A CAR? Real ID law is impractical and unenforceable. One case in Florida road tested the criminality of individuals divesting themselves of the nationalized DMV requirements. Real ID has proven to make US citizens practically, less legal. It equivocates those born here will never have enough documentation to satisfy Real ID requirements. Both the documented and undocumented share the same fate of being illegal residents without proper identification. This leaves immigrants and citizens in a deliberately complicated quandry. The federal government's mandate suppresses the ability for US States thrive and perform normally. It's time to tell federal document nazis, again, to get out of your State houses. For now, first adopters of Real ID's State instituted plan have proven they will implement hardship on American residents, encumbering the local driving economy. The Immigration argument seems to scabb off as citizens confront losing their "driving privileges" and identification rights en masse. People will to drive to their job if they have one.